Door-to-door trick or treating is a scary good time for children. For some parents, it's just scary. Give your kids a boo-tastic time and eliminate your frightfest with 10 trick or treating alternatives so your children don't go door to door in search of candy. Other parents may share your same concerns about turning the kids loose in the neighborhood. Plan a kid-friendly Halloween party and invite your children's friends over for a spooky night of fun. Create your own party invitations for parents and their kids. At the Halloween party, hand out treat bags, play Halloween party games, and eat themed foods like bloody eyeballs or kitty litter cake. Make time more important than treats when the whole family spends Halloween together. Everyone must wear costumes, even the dog. Put the kids in charge of answering the door for trick or treaters. Stay close by but hand over all the candy to your children. They decide who gets what type of candy and how many pieces per trick or treater. In between visitors, try Halloween rubber stamping projects or make creepy crawly critter crafts. Eat homemade party treats and snacks together while you have a family movie night right in the living room. After the last trick or treater has come to the door, surprise your child with a tin can pumpkin filled with candy spiders or Halloween toys for answering the door all night. You may be surprised at how people can dress up the trunks of their cars to give out candy and offer festival games with prizes. That's the idea behind trunk or treat. People line up their cars or park in a circle, decorate their trunks for Halloween, and pass out candy to the children. Schools, local organizations, clubs, communities, and churches participate in trunk or treat. 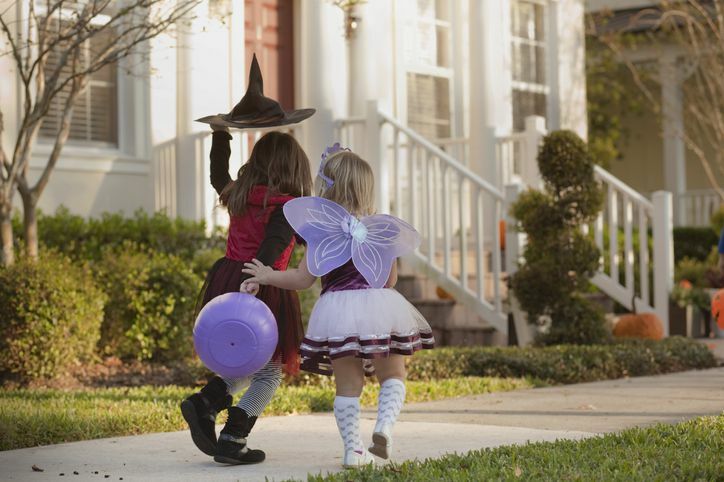 This safe alternative to door-to-door trick or treating keeps the kids together and is an experience you won't soon forget. When your kids see dry ice fogging up an SUV's pumpkin patch or a small petting zoo spilling out of the back of a horse trailer, your kids won't regret skipping doorbell-ringing all night. Trick or treating with your kids at a local nursing home combines fun with a kind gesture toward others. Some of these residents don't get many visitors so seeing your children is a huge treat. They give your kids candy and make a big fuss over your children–the latter being each parent's favorite moment of the trip, of course. Call the nursing home ahead of time to arrange a visit. If you're in a playgroup, see if you can all meet up at the nursing home to trick or treat together. Churches typically hold reformation parties or harvest festivals instead of billing the event as a Halloween celebration. Kids can wear their costumes, although churches usually ask you not to wear scary costumes and masks. Anyone is invited to attend. You don't have to be a church member to bring your family. Activities for the children include games, costume parades, inflatables, and hayrides. Candy is also handed out so the kids get to trick or treat at the church. Some churches may even provide a potluck dinner but you're not required to bring food or pay an admission fee to participate. Look for signs outside of churches or call any church to find a reformation party or harvest festival. The church secretary can probably give you a short list of churches with planned activities. To keep children safe, many fire and police departments plan a Halloween event at their stations. Firefighters and police officers hand out candy. Kids get a peek at the inside of a firehouse or police station. You might even get a personal tour and an up-close look at the fire engines or police cars. Call your local police department's non-emergency line to see what's planned in your city. Most newspapers, radio and TV stations also promote the hours and locations that are open for trick or treaters. Get your neighbors together and throw a Halloween block party for the kids. A few parents can help organize the event with face painting, simple food and drink booths, a costume contest and outdoor party games. Set up a candy stand with a big selection of treats. Let kids create their own candy bag with non-toxic paints or markers and then let them pick out a certain number of goodies to customize their own treat bag. Use home Halloween decorations to dress up your neighborhood. If enough houses participate, children can walk down the street with their parents to determine which house is decorated the best. Kid voters only! Your local community may offer Halloween festivities throughout the month of October. Kids can trick or treat at the zoo, play games, and go on a hayride. A candy village might be set up in the park with activities and sweets for the children. Festivals could include music, a pumpkin walk displaying a variety of creatively-carved pumpkins, age-appropriate haunted houses, and trick or treating. Check your local community calendar to see what your city has planned. You can also contact your convention and tourism bureau for more information on each event. Malls provide a safe environment for you and your kids to trick or treat. They're especially nice if the weather is bad. Children trick or treat at each store with some employees handing out candy right at the store's entrance. You'll probably find store clerks who are also dressed up in the spirit of Halloween. After you're done trick or treating, head to the food court for dinner. Letting the kids eat in their costumes will make your night more than a stop at the mall for candy. Many theme parks transform from summer thrills to fall chills in October. Haunted houses are built and cobwebs are spun. The screams from roller coasters take on new meaning when ghosts and goblins are added to the fun. Most parks separate adult and children's activities so parents know exactly which ones are appropriate for their kids. Finding Halloween events that appeal to your family's interests will lead to a memorable night that doesn't depend on sacks full of candy collected from door-to-door trick or treating.